Note. The current text window; this is the default tab. Section. A note and its descendants. For note and section, each distinct occurrence of a word is counted. 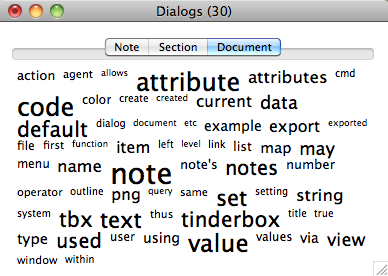 For the document level view, Tinderbox counts the number of notes that contain a word 1 or more times. The display contains up to 100 words - less if there are fewer valid words in scope. Changes to text in open note windows are not reflected in the dialog. If necessary, close and re-open a note window in order that the Common words list is refreshed to reflect recent edits. The view only maps the note selected at the time the view was opened, and doesn't track changes in selection. To analyse another note, select it and open Common Words - a new view window will open. Note that more than one such view can be open at the same time. If called from a major view selection, the dialog only populates the Document tab. The font sizes in the Common Words display are automatically chosen to fit the available space. Clicking on any word opens the Find (search) window and searches for that word in the text or title. Note that Common Words only indexes full words, which then search indexes substrings; clicking on 'clock' will also find notes that refer to 'clocks'. Besides a note's text and title, Common Words also indexes user string attributes. Thus, results from a normal Find and one called via Common Words may differ in their results. Copy. Places a copy of the selected view, as styled text, on the clipboard. Copy view picture. Places a copy of the selected view, as an image, on the clipboard. Stoplist words: Tinderbox ships with a default list of very common English words which is found in the stoplist.txt, a Tinderbox configuration file; see the latter for how to add a user-customised version. Users in non-English language locales will benefit from using their own custom stoplist as the built-in defaults are all English based. As only one custom stoplist.txt file can be used at a time, users writing in multiple languages may chose to use one file with entries for multiple languages or use single-language files and swap them out as required. To allow users to set an additional stoplist of words that Common Words will ignore, Common Words looks for a note named "stoplist". If one is found, the words in that note are added to the general list of words that Common Words ignores - for the current TBX. The list is case-insensitive. Words may be added to the stoplist file or note either one per line or as words with a single space between them; note the latter means that phrases will be interpreted at word level (which should achieve the same effect). If no note is currently selected, the document pane of the dialog shows common words for the whole TBX file. From v5.10.2, the word listing is drawn in a slightly darker text for better legibility. What is a Tinderbox 'document'?